Be the first to share your favorite memory, photo or story of Arica . This memorial page is dedicated for family, friends and future generations to celebrate the life of their loved one. 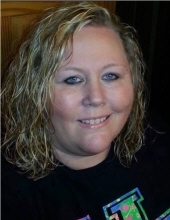 Mrs. Arica Jane Clark Jarrells, age 37, of Vanceburg, Kentucky, passed away Sunday, March 24, 2019, in Lewis County, Kentucky, from injuries sustained in an automobile accident. She was born May 19, 1981, in Portsmouth, Ohio, a daughter of Kenneth Clark and Vonda Johnson Clark and Bud, all of Vanceburg, Kentucky. Arica was a member of Vanceburg Church of God and worked as a Certified Medical Assistant at Bestcare in Wheelersburg, Ohio. She enjoyed going to church events, four wheeling and spending time with her family and friends, especially with her sister, Vanessa. In addition to her parents, she is survived by one sister and brother-in-law, Vanessa Gibson and John of Black Oak, Kentucky; her paternal grandmother, Violet Brown Clark; and several aunts, uncles, nieces, and nephews. She also leaves many other family members and friends who will sadly miss her. Funeral services will be held at 11 a.m. Friday, March 29, 2019, at Dickerson Funeral Home in Vanceburg, Kentucky, with Brother Tim VanHook officiating. Burial will follow in the Bethel Cemetery in Ribolt, Kentucky. Friends may visit from 6 p.m. to 8 p.m. Thursday, March 28, 2019, and after 9 a.m. on Friday at Dickerson Funeral Home, 110 West Second Street, Vanceburg, Kentucky 41179. Corey Rister, Waylon McCane, James Lewis, Jay Jordan, Andy Clark, Daniel Bentley and Cody McCleese will serve as pallbearers. "Email Address" would like to share the life celebration of Arica Jane Clark Jarrells. Click on the "link" to go to share a favorite memory or leave a condolence message for the family.